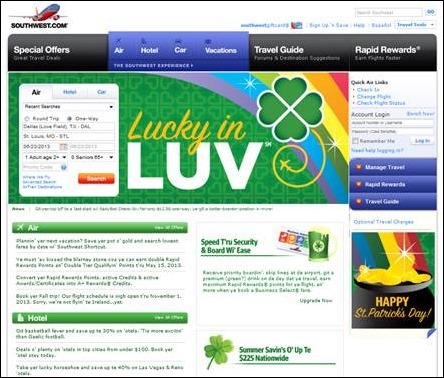 I got a laugh yesterday when visiting the Southwest Airlines website. In honor of St. Patrick’s Day, they revamped it with a green color scheme and leprechaun-friendly prose. They’re one of my favorite airlines, not only because they are consistently on time and predictable, but also because of their corporate culture. Culture has been in the news recently with Yahoo’s recent change in its work-from-home policy and the resulting backlash. In many ways I agree with Yahoo CEO Marissa Mayer that having employees in the office is important. As someone who has worked both in a cube farm and remotely, there are challenges to not being in physical proximity to co-workers. There is a loss of ability to read non-verbal communications and it’s hard to build workplace trust with co-workers you’ve never seen or met. My biggest issue with many people working from home is the risk of multitasking – it’s all too tempting to multitask in ways that you would never do in the office proper. I did really enjoy working remotely, however, and was a lot more productive than I was in the office because I could focus and work on complex problems without interruption. I can see both sides of the argument. A recent piece on the corporate culture at Google illustrated their efforts to keep employees happy when coming to the office. Themed conference rooms, “design your own desk” offices, and free meals join subsidized massage therapy at the office as perks. (I’m not too sure about the claim of free weekly eyebrow shaping, but to each his or her own.) The idea at Google is to make it a place that people want to come to rather than forcing workers to the office each day. The comments on the Google piece were pretty fun to read as well and several gave me a pretty good chuckle. Comparing a place like Google to the average healthcare IT workplace is like comparing apples to oranges. Unless you’re at a progressive vendor with a lot of money and a culture of innovation, you’re probably making do with what you have and with few perks. Being in the non-profit hospital space, I can definitely attest to making do with very little. My current office is an abandoned conference room, which was taken out of service because the conference table didn’t really fit and also because the ventilation is sketchy at best. Being in a cube at the time, I snapped it up simply to have a door and a place where I could go to have private conversations about disciplining physicians or to just sit in silence for five minutes to get my head together before a day full of meetings. I had to go to the hospital’s “dead furniture room” to pick out a desk that is decidedly from the Reagan administration. Our ambulatory division is housed in the former billing office and has very few conference rooms, which makes it difficult to have meetings. Even though we’re sometimes crammed in and bumping elbows, we have a rule that if you’re in the building, you’re expected to attend in person. We have a group of extremely cohesive managers and I can’t help but think that our meeting culture helps keep that team strong. In contrast, our inpatient division is housed in a brand new building that was designed with functional layout in mind. Although the cubes are short and the floor plan is open, there are scores of meeting rooms (from small two- or three-person huddle spaces to massive training suites) which allow for both privacy and collaboration. Despite this, the office culture still doesn’t encourage workers who are physically in the building to attend meetings in person. Sometimes no rooms are booked for meetings, which leads to annoying conference call behaviors and rampant multitasking, not to mention entirely too many “can you repeat that” type statements. There’s also nothing worse than being on a call with the person in the cube next to you when you hear their voice through the air and then hear it on the phone seconds later due to the conference line delay. People are so busy on instant messenger and doing multiple projects that they can’t focus. Having worked in a variety of environments, I know that getting people in a room together would be beneficial. Alas, it’s not my division, however, so all I can offer is my suggestions and my support to the leadership should they decide to make people start showing up. If they’re not going to make them come to meetings, they might as well let them work remotely and cut the office overhead. Regardless of division, our employer no longer provides coffee or any other amenities in the office. We’ve turned into people who hoard spare forks and ketchup packets just in case we forget to bring them from home. There aren’t even cups to offer water to visitors, and don’t get me started on the “Coffee Club” vs. “Keurig On Desk” cliques. We’re not on the hospital campus, so there’s no cafeteria and we’re at least 15 minutes from the nearest restaurant, so brown-bagging is a must. I sent the Google article to a couple of colleagues and the responses were generally of the head-shaking variety. Whether you’re a vendor or an end-user, how’s your workplace culture? Leave a comment and let us know. For situations where employees are located near an office, working from home is a perk for which there are pluses and minuses. But the small Healthcare IT company we started 8 years ago (Ignis Systems, now part of Liaison Healthcare) took a 100% remote worker approach from the very beginning. We realized that we needed to be able to attract and employ people with very specialized skills, and requiring that they also be near our headquarters was too much of a constraint. To make this work requires an intensive focus on communication and teambuilding, even when people seldom meet face-to-face. For example, we have an all-hands call every week where every employee has a chance to talk about what they are doing, their successes and challenges, and to compliment each other on their work. We also have an annual all-hands get-together, which has some training value but is also largely social. Having all remote employees puts the responsibility on managers to build strong personal relationships and to reach out frequently to their workers. It may be that this approach was most appropriate for our very early stages. For one thing, there’s no realistic way to hire and train entry-level employees, but in our case we were looking for senior people anyway. And if we had four or five employees in a given city, we would probably provide an office. But building our team based on everyone working remotely was very successful for us; it can work well if you build it into your culture. At my workplace we have a mix of remote and office staff. A lot of the remote staff is the more senior staff that does not need as much assistance. They are also pulling in some remote staff similar to Yahoo so they are all together. I work remote now but was in the office for a few years. I am more productive remote but that is due to my knowledge gained working closely with my peers. No way a remote person could learn it. They need a mentor right there for at least a year. Working in the non-profit hospital IT world, I have had my share of offices/cubes in old buildings. I once was housed in an old Lowes warehouse, converted to offices and storage. We had plenty of mice running amuck, not counting the stray cats having kittens in the warehouse. Also was in a very old wing of a hospital where paper mites where our best friends. Best office I ever had was in an old house located on the main campus of the hospital. It was a home built in the 20’s and my office was formerly one of the bedrooms. Best part about it was that I could open the windows and hear the birds and feel the fresh air. Now my office is located in an offsite building, with great parking, but they refuse to repaint our offices, which leaves us sitting in an office with walls that have so many holes it looks like they were shot up by a machine gun. No complaints though, as I appreciate having a window (that doesn’t open) and a door. Google employees don’t know how good they have it! I have worked mostly remotely since the mid 1990’s both as a vendor and in a health system and have found that I am far more productive remote. It did take some time to learn how to focus with all the home distractions and build relationships by phone, IM, email and most importantly showing up from time to time. I know multi-tasking is an issue during meetings both with people physically present and dialed in but that always makes me ask if the meeting was even necessary or well organized. My personal experience is that any meeting with more than a handful of people is usually long on talk and short on assigned deliverables. So while we are assessing the best workplace environment for each employee, we should also be taking a long hard look at meeting management. While there are other reasons to bring people together at least from time to time, large meetings don’t seem to me to be a good reason. All good points on the need for human interaction in most work! We are in Minnesota and occasionally, like yesterday, there were folks whose 30 minute commute took two hours due to weather and road conditions – in those cases it is nice to have a policy of remote working, even if it is not every day. I have also lived in the Bay Area and can see where having to go to work anywhere can be a daily commitment of several hours – that is not a life I would want. Remote workers also have the potential for keeping cars off the roads, and all the good things that come from that. We have some folks who do heads down type of work (transcription, etc.) and they have the option of being solely remote workers. I also worked in an environment where we had Triage nurses who worked remotely, but we hooked them up through various social media to allow them to communicate with each other and folks at the hospital – occasionally they would ask people to come in for a meeting, which was much about teambuilding as the expressed reason for the meeting. I worked for a small vendor as a trainer that required all staff to come in everyday regardless of role, blizzard or illness. No flexibility or options for IT ,support, sales or others. It was just a disruptive and unproductive culture. No eureka moments were achieved after the 4.00pm hour by requiring employees to stay late. Case in point – company is and will undoubtedly fall off the map and soon become irrelevant come MU Stage2. Moved on to another that is an advocate of working remote and I can say that my productivity is high and there are long days and short days and crazy days. It comes and goes but I certainly am motivated and more productive. While there is little distinction between work and home i.e the laptop / phone is always nearby, i have flexibility and I personally tend to work a lot more hours. keep in mind all the adminstrative burden falls on you when not in traditional office setting. Working from the Office or remote should be role based. IT and support teams probably need to collaborate in a rapidly changing environment like HIT to build, deliver, fix solutions real time. Similarly Marketing / strategy teams would also benefit from face to face collaboration. Sales teams, trainers, project managers etc are likely going to work remotely as they travel and are customer facing. I think this should be role/ team/ need based rather than a blanket policy. And within these parameters teams that are remote i.e sales, implementation, PM’s should have regular face to face meetings at least quarterly if not more often.